Unlike many public policy or political issues, the transportation issue gets personal in a hurry, especially if you’re a Portland area commuter. You see it (and you’re stuck in it) almost every day as you head back and forth to work, go to the grocery story, or ferry the kids to school or activities. It’s getting worse. So why haven’t our state’s roads, bridges, and transportation arteries kept pace with our population growth and demands of the 21st Century? Why is gridlock costing Oregon jobs and driving up prices for working Oregonians who are wasting time stuck in traffic? Failed leadership in Salem. Gov. Kate Brown’s failure to get a transportation package passed, after saying she wouldn’t allow the Legislature to leave Salem without one, is the definition of failed political leadership. In signing the low-carbon fuel mandate, Brown sided with extreme environmentalist rather than working (and commuting) Oregonians. These forgotten Oregonians will pay from 19 cents up to a dollar more per gallon of gasoline. Brown’s hidden gas tax won’t fix or repair one road or bridge – or, for that matter, reduce global warming. It doomed passage of a transportation package in the 2015 legislative session. In fact, Governor Brown didn’t even include a transportation package in her agenda for the 2016 legislative session. Photo: Bud knows that not improving our transportation infrastructure will continue to harm Oregon’s economy and quality of life. Stop favoring out-of-state companies at the expense of Oregonians. Repeal the Low-Carbon Fuel Standard law so ordinary Oregonians will not have to spend an extra 19 cents to a dollar per gallon of gasoline in a hidden gas tax whose proceeds will go to state-favored, out-of-state, green energy companies. Pass a multi-year transportation package designed specifically to reduce highway road congestion, especially in the Greater Portland Region. Build a system of north-south arterials in Washington County to deal with the problems that the Westside Bypass was supposed to address in order to reduce 217 gridlock and spillover congestion in Clackamas County. Oppose income taxes on employees in a transit districts across Oregon to fund transit projects. Execute strategies that reduce carbon emissions resulting from rush-hour idling and congestion such as incentives to businesses that participate in flex-time scheduling. 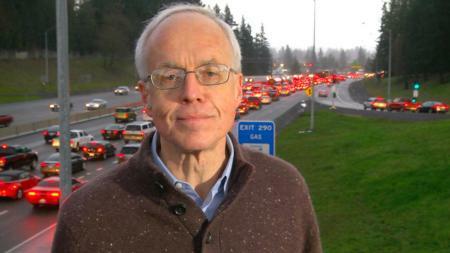 Bud Pierce believes we must end “government gridlock and game playing” and “crony capitalism” in Salem to end the congestion that Oregonians sit in every day. It’s personal for him because it’s personal for you.